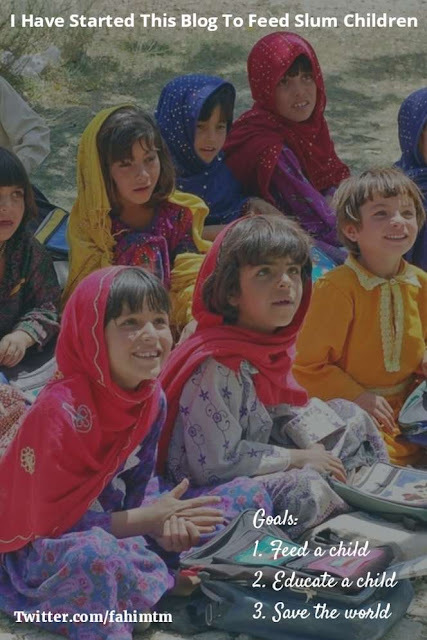 The reason behind starting this blog is to help poor Children!! Starting a blog should not be for only self-help or self-promotion. Blogging should be for people anywhere in the world. So, Why I have started this blog? Why should I continue blogging? I'm not a blog genius, but I was writing for few years about Blogging and entrepreneurs. I want to dedicate this blog to millions of slum child (orphans) in the living earth. However I will not be able to help everyone, but maybe a few. And maybe more writer like me will come and join me to make the dream comes true. "Yes you read it right, I've started this blog to help orphans and or slum children." Before I tell you why I'm starting this blog, you should know something about me. Not very personal... I have always been one who liked to help. I never wanted to see people sad or hurting or in need, and seeing those things always made me rush to help. It's how I'm hardwired, I'd say. This blog, in a way, is my attempt to "help" in some small way and has been on my mind for years, actually. I'll explain. I started making money seriously from online as a freelancer about 6 years ago when my dad bought me my third computer. My first experience with computers was started with games. From the very first day, I was an addict to computing, and I loved everything I did with it. Specially NFS 2 and Fifa 98. That was my golden time to start with the technology world. As I grew up and I learned many things from my relatives and other friends, actually I wanted to find out more about this little thing. What big inside? When I heard that if I have an Internet connection, then I could earn money, from that day I was determined I will do it. In the meantime, no one was there to help me. So I had to survive alone, and I did. Now let me tell why I have started this blog. So I guess as I can help you to take your life to the next level or I can help you to become a better entrepreneur. 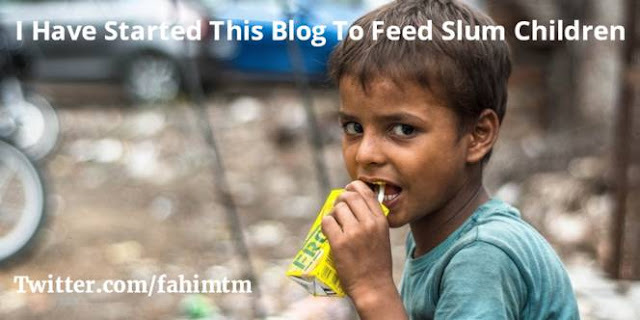 The main reason behind starting this blog is: To Help Slum Children and or Orphans, who really needs! If I can earn from this blog, I'll share its 80% Income to children who don't have food, who don't have clothes, who can't be educated. I want to stand with the children who needs real help, not virtually "God, Please Help Them" Status via Facebook, Twitter or viral social media. The primary goal to start this blog is to give some foods to those children who lives in a slum and who are parents less (orphan). Now if you think what I will do with the rest of 20% income of this site? 1. Feed a child: If I can feed a child by doing this, slowly I'll be able to do this for many of them. And I'm sure many people will come with me to stand, and they will feed more child, in this way we can feed many. 2. Educate a child: An old proverb "Education is the backbone of a nation" is very true. If we don't have an educated society, then we have nothing even if we have much wealth. So we need to educate our children, I'm starting from one and will do it for many. 3. Save the world: The world is not going down, we are making it down by wasting its energy because we don't know how to use it properly and save our living home. If we can teach everyone how to save the earth and all we practice this properly maybe this earth can be a heaven. I'm starting this from zero, the goal is to reach thousands. Note: This information will be updated with new goals as and also will be updated with achievements. Let me clear it, This is what I'm gonna pay for the host or domain maintenance service and another marketing service. Starting a blog is not very costly but it needs some money and to let it know to the people takes more. So I need to spend it. Now you may think why I should do this? What will I get? I will do this because I'm responsible for the world, I'm accountable to my country and nation. I want a happy world, a holy nation and you know to make all this we, of course, need an educated generation. If We can educate our next two generation, just think it, the onward generation will be educated automatically. Then no one needs to help like this. Or if needed, I'm sure there will be thousands of people to come out. I've already said I'll do it from this site revenue. I'm not rich, so I can't spend enough from my pocket. Below are the minor reasons and how will I can get some revenue. I'll be able to do this if I have enough readers here, I have the BIG chance to stand up and change the world a little. 1. I wish I could Inspire your life via this blog, just be my regular reader and let me give a chance to proof how I really can help you. 2. This blog is a multi-niche blog, I want to share everything in my mind comes up. So maybe I'll get more readers. 3. My wish to help you every step of your life by giving great advises and little tips by this blog. 4. Everything I have learned in my life I wanted to share and let you learn. 5. I will give you my best effort to start your small business or online business from my previous online business experience. 9. My aim to learn more by discussing here with you. I know you can teach me. 11. My plan is to try something new every weekend and share the thing with you guys. 12. Some natural treatments and home remedies will be shared time to time. 13. I love adventures, I have some great story to share with the world. 14. My DIY projects have a large collection to share yet to the giant world. 15. However, life and work changes over the last few years have meant the writing and doing social duty has slowed down and now with this piece of gold to write with the golden ink into a virtual land maybe I can join the world again. Please note that I am not a medical professional or a dietitian. I am just sharing what I have learned from personal experience. Or what I've learned from my relatives and friends. Please also note, I'll share how I progress in my mission in time to time with proofs and more related things. If you are inspired by my story to stand up for the helpless people and consider your mind to start a blog to help orphans and or slum children you may want to learn a few things just before you start a blog! If you already an expert of blogging maybe you need some niche blogging idea, which I'll give you in my next few post. If you want to help the world and those children who are food-less, helpless, please stand with me and share this article over the billions internet user.